1. When I was a student at UT Dallas I was a server at Cheddars Casual Cafe in Garland, TX. While I was there I crossed paths with probably hundreds of different servers who were employed by the restaurant. There was one server in particular named Grant whom I interacted with off and on at work but nothing consistent. In mid-September I ran into Grant on campus and we began to catch up (we haven't seen each other in around 3 years). I learned that he had several life-shaping experiences and has begun to follow Jesus! We've talked more and more over the weeks and he is wanting to study the bible together - praise God! Please pray that our friendship and bible study would be enriching for Grant and that he would go on to make disciples in his life! 2. Campus ministry changes from year to year and as students graduate we pray that God would fill roles that they may have served in from year to year. We have been praying for students to step up and join our worship/praise/sound team(s) this year and God has answered in a big way! We have had over 50 students sign up to help with sound, moving equipment, playing instruments, singing, and doing creative things at our big group services. We are having a worship & sound training day/hang out on Oct. 11th and I'd invite you to pray that these students would impact the next generation of students here at UT Dallas! I wish you all were on campus with me seeing what your support has been going to. We had our UTD FOCUS Fall Camp this past weekend and it was a blast! I included (lots of) pictures below for you to see. Thank you so much for all of your support - partnering with you is such a joy and encourages me in any situation I find myself in. Knowing that you believe in the mission and believe in me means the world. Myself (left), Morgan (middle), and Ryan (right). Morgan and Ryan are both small group leaders in FOCUS. We went to visit Ryan during our weekly meeting. Please pray for Ryan! Our UTD small group leaders meeting on Monday to discuss fall camp, how small groups are going, and to pray with one another. These students are off to a great start for the year! 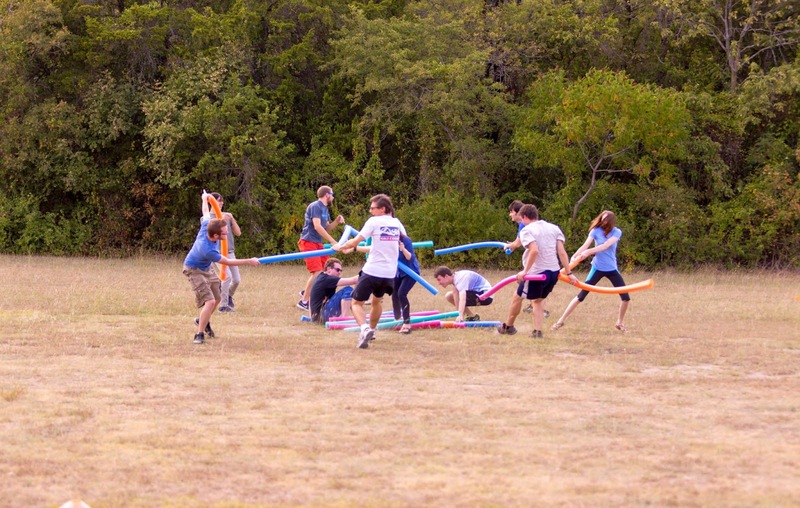 During Fall Camp our students played LOTS of fun (and sometimes a little violent, haha) games with one another. I am so honored to have you on my support team. Please pray that we would not stop working hard for the Lord and that no students would fall through the cracks and not be offered the opportunity to be a part of a 1 on 1 disciple-making relationship. I love you all and hope to hear from you soon!